Being 'eco friendly' may sometimes seem complicated, time consuming or expensive, but doing this action is outrageously simple: turn off the lights! No one likes that moment when the bills come in and the hard-earned cash goes out. 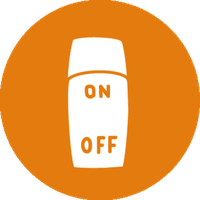 Lighting typically accounts for 15% of an average households' energy bills.1 You could quite literally reduce your bills with the flick of a switch. Climate change is happening. 97% of the world's scientists agree that man made climate change is a real thing. It's happening now, but with a little effort from each one of us, we can stop it getting a lot worse. If you're still sceptical, or would like more facts to convince your friends, take a look at Climate Reality Project's 'Climate 101'. It's no news that climate change is caused by carbon emissions, and that electricity generation is one of the biggest sources of carbon emissions. So leaving your lights on when not needed is a completely unnecessary contributor to climate change. Even if you have energy-saving light bulbs, there is still nothing better for saving energy than switching them off when not in use. Not in the room? Lights off. Daylight outside? Lights off. You can also go the extra mile and insert sensor or timer lights to avoid leaving lights on in areas like porches and stairwells. There is a long-standing myth that leaving lights on for a few minutes uses less energy than turning them off and on again. In fact, its almost always best to turn lights off when you leave the room, saving you energy and money on those pesky bills. That's pretty much all there is too it. It's harder than it seems when you sign up, but it's much better than just giving a few pounds donation to ease your conscience. It's a great idea. I always turn off the lights when I leave but now I try to minimize too by keeping the curtains open and using the sunlight. I often would walk out of a room and have to turn back to make sure I turned the light off. By the end though I was even encouraging my family members to turn lights off. I always go around switching lights off that have been left on unnecessarily, even at home. it drives some people mad but it saves so much energy and money. Kept up with it and will continue to do so. I even have a new slogan: SWITCH IT OFF, TO BE SWITCHED ON!!! It definitely made me think twice before leaving a light on unnecessarily! Saved money and so easy to do! I share my office space with other businesses and collectively we have all been doing pretty well and keeping all unnecessary lights off, particularly now the days are lighter for longer! It makes sense - just requires some discipline. Such an easy behaviour change, and one that I am going to keep up! Such a simple thing to do, but for some reason I would always leave my lights on in the past! Pledging definitely meant I had it in the back of my mind when I left a room - so I'd make sure to turn them off each time! Was a challenge with a three year old running around! But teaching him to do the same has had a mostly positive effect. As a family we were all able to remember to do this. Totally nailed it and will continue to do so. Not only is it friendly for the environment but it helps cut down the cost of electricity bills as well. Mike Berners-Lee (2010) The Carbon Footprint of Everything, Profile Books Ltd.